Today I ride off into the sunset with these two handsome young men. 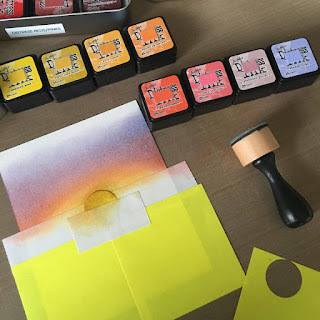 This post is my last So Suzy Stamp post for awhile. Hopefully I'll be back sometime in the future, but for now, I'm stepping down to just be Nana for awhile. I've had so much fun being part of Suzanne's Design Team for the past six months. I thank her, and the other DT members for being so encouraging and helpful as I stumbled my way through deadlines and projects and blogging. I am truly grateful for their support. So here it is... my farewell sunset. 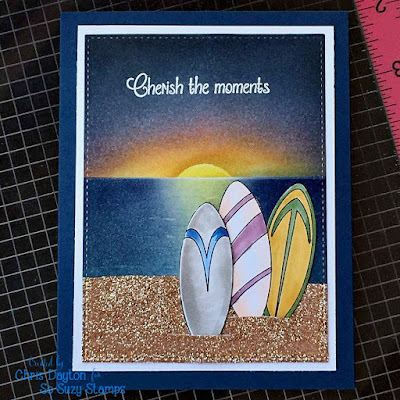 I am using the Surf Boards and Cherish The Moments stamps for my post today. I began my front panel with a 1/4 sheet of Fabriano 90# Hot Press watercolor paper. I used a strip of Post-It tape and a few Post-Its to mask off the area below my intended horizon line, and sponged my sun with Mustard Seed Distress Ink. 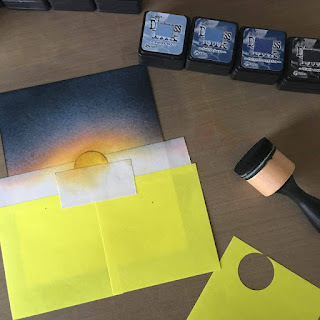 I used a circle punch to create another mask to keep the sun "clean" then continued sponging warm colors above and around the sun. I kept adding colors, working my way to the cooler sky colors. Once I felt my sky was complete I removed the masks and let it dry completely. While it was drying, I stamped my Surf Boards onto a piece of Hammermill Digital Color Cover paper with Memento ink, and colored them with Copic markers. I fussy cut my surfboard images, separating the full surfboard carefully from the other two. I also prepped my "sand" by making a huge mess. I am SOOO glitter-challenged. It's more than a habit that I spill... It's guaranteed! But I used a piece of self adhesive label paper. I cut a strip, peeled the backing away and liberally covered with Nuvo Rose Gold Pure Sheen Glitter. 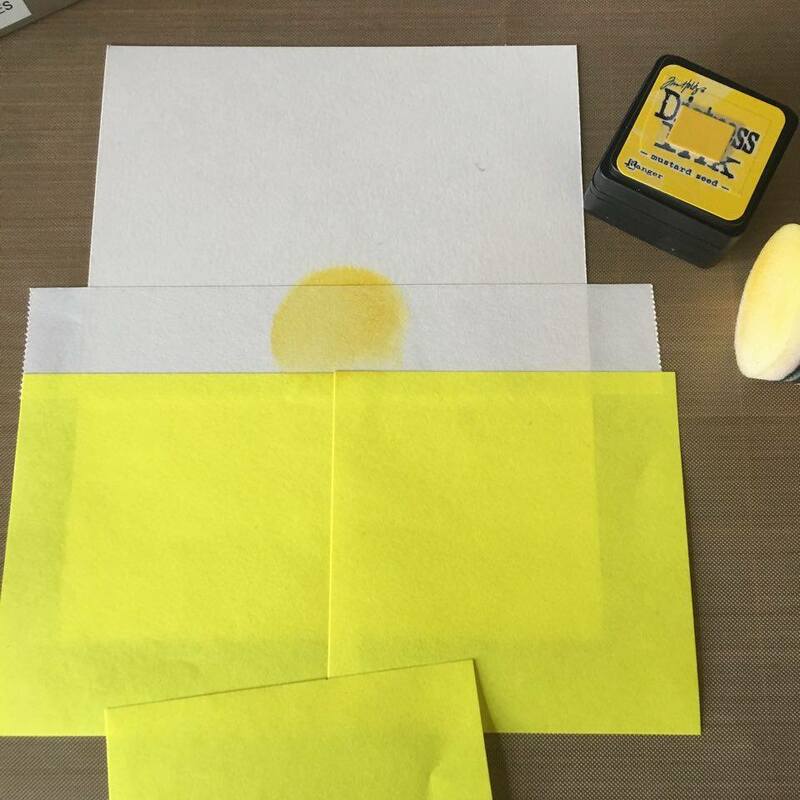 I just shook off the excess and then covered it again with the paper backing, and burnished it into the adhesive with a teflon bone folder. I then cut a slight curve into the edge to resemble a random uneven shoreline, and set it aside for later. Moving back to my front inked panel, I adhered more post its and tape to cover the area above the horizon line, then did a similar inking technique to the other side to create the reflection on the water. 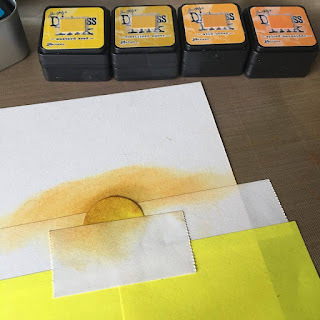 I used slightly lighter inks when to do this to imitate the diffusion of color on water. I then adhered my glittered sandy beach to the bottom of my panel and cut it, using a 3.5 x 4.75" stitched rectangle frame. (This one is from The Ton Stamps.) I decided my panel was just a little too bright, here, so I added a bit more Chipped Sapphire and Black Soot Distress Ink to darken it up just a bit more, pulling that water reflection in narrower a bit. 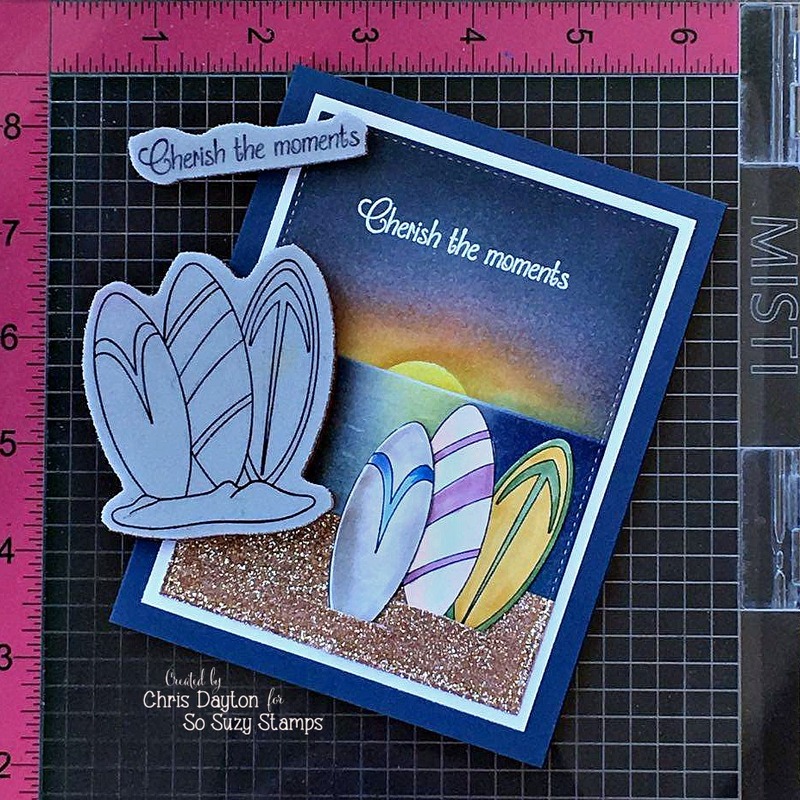 I used my Misti to stamp my Cherish The Moments sentiment with Versamark and heat embossed it with white embossing powder. 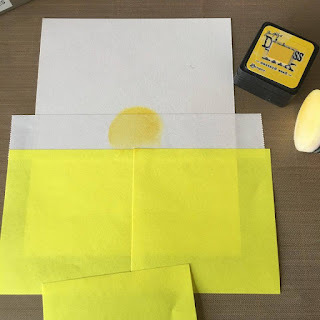 I then used regular water, a paint brush and a paper towel to wet, then lift the ink away to create some waves. My next step was to use a craft knife and cut two slits right through the glittered paper and the panel, so I could slide my surfboards right into the sand. Once they were positioned, I glued them in place. I then cut a white 3.75 x 5" white mat, and layered my panel and mat onto a navy card base. Thanks so much for traveling with me on this journey over the past six months. I have enjoyed it all, and will always Cherish The Moments. And now... Adventure awaits me with my favorite two little twins! 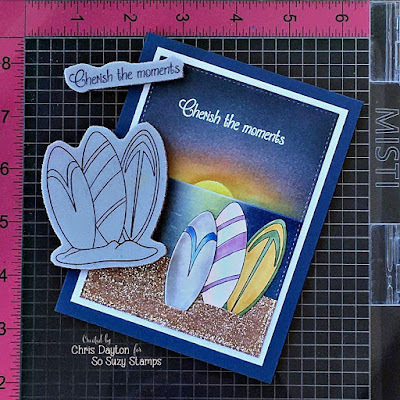 Super gorgeous card, Chris and beautiful instructions! You Enabler! I had to get the glitter! Beautiful card Chris. I always enjoy your designs. Now you enjoy those precious little ones.